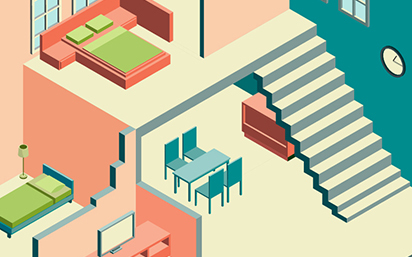 Just how much residential real estate can you buy for your money across the country? What does £100,000 get you? The infographic below shows how this varies across the country. In Burnley it’s enough to buy a two bedroom semi-detached house. In Leicester it would get you a reasonably proportioned one bedroom flat. 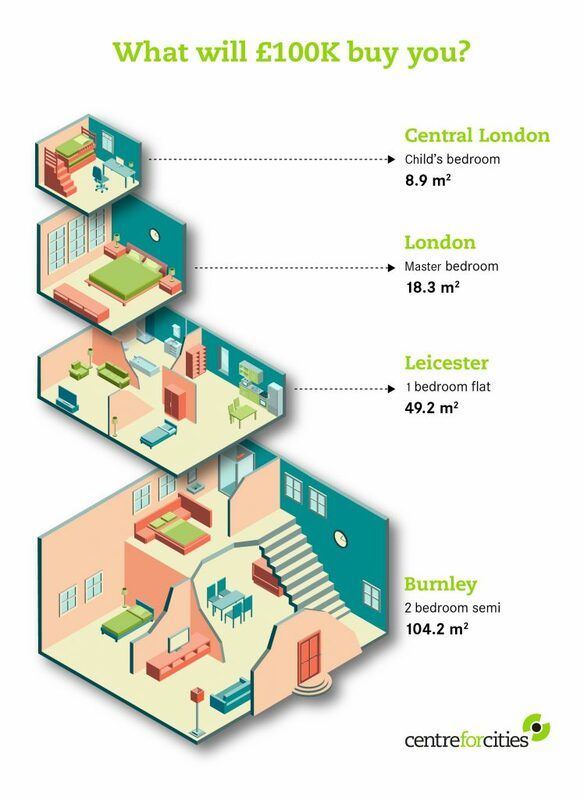 In London you’d barely get any change were you to buy the space equivalent to a good-sized master bedroom. And in Central London £100,000 buys you just under nine square metres – the size of a (small) child’s bedroom – which, as the old phrase goes, doesn’t give you much room to swing a proverbial cat. So the smart money would be on buying in Burnley. Or that’s what we often hear when we visit parts of the country where the economy is struggling. We’re often told how city X is a great place to live, and how their substantially cheaper housing makes it a no-brainer to move to their area over places like London or Reading. Only the reality is that this great migration does not occur. A large proportion of top graduates move to London after university. And of those who quit the capital, around two-thirds remain in the Greater South East. This is because of the strength of the capital’s economy – its large number of higher-paid jobs and career opportunities pull in the brightest and mean that those who leave the city itself remain very much within its orbit. The choice that these people make shows that in weighing up access to jobs versus the cost of housing, access to jobs wins out. There’s no doubting that having coastline or countryside on your doorstep appeals (how the quality of life is usually measured in these conversations), particularly to people as they get older. But this isn’t enough on its own. Struggling cities that are serious about attracting in both investment and people need to focus on tackling the economic barriers that make them less productive than their counterparts elsewhere. The data also shows once again how there is no such thing as a national housing market. Unaffordable housing is an issue that mainly affects cities in the Greater South East, and is one of the costs of growth. This is bad for these economies because it prices people out of the opportunity within them. In other places the challenge is to get the economy growing – their low house prices are a sign of a lack of demand due to the weakness of their economies. This means that a varied policy approach is required across the country. Housing Infrastructure money should be mainly focused in the Greater South East because this is where the housing crisis is most acute. And policies designed to improve productivity should have a greater focus on other parts of the country where this is lagging. That £100,000 gets you more or less house in one place over another is reflective of a bigger set of economic challenges. The implication is that not every place should get an equal share of every pot of money created – be that for housing, transport or skills. Different places face very different challenges. Overcoming them will require targeting of specific funds to address these challenges.